MANILA, Philippines (AP) — Philippine officials said Sunday that they would not release two leaders of a violent rebel group fighting to overthrow the government, whose arrests were a serious blow to one of Asia’s longest-running communist insurgencies. 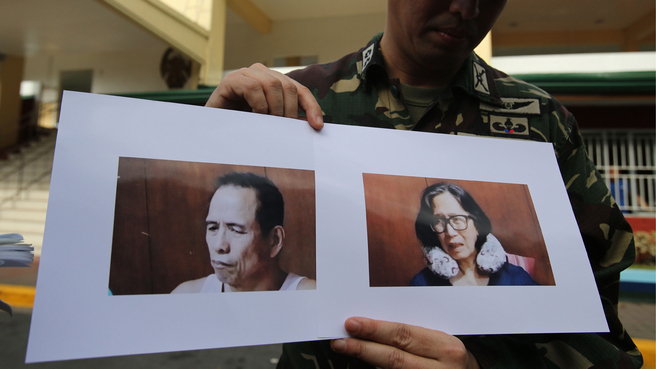 Communist rebels have demanded the release of Benito Tiamzon, chairman of the Communist Party of the Philippines, and his wife, Wilma Austria, who were captured in central Cebu province with five other suspected Maoist insurgents on Saturday. The arrests were a big blow to the 45-year Marxist insurgency, one of Asia’s longest and most violent. The military has described Tiamzon, 63, as the “center of gravity” of the Maoist insurgency who has overseen major rebel actions for years. The United States has blacklisted the group, which has about 4,000 armed fighters, as a terrorist organization. The Tiamzons have been charged for their alleged involvement in the 1985 massacre of 15 people whose remains were discovered in a mass grave in 2006 in the central province of Leyte, according to the military. The two and their companions were traveling in two vans, apparently to move to another hideout, when about 40 military intelligence agents, soldiers and policemen blocked their path in a downtown area of Cebu. Authorities seized four pistols, ammunition, two grenades, four laptop computers, 16 cellphones and rebel documents from the captured guerrillas, the military said. The rebels condemned the arrests, saying the two were consultants in stalled peace talks who were granted temporary immunity from arrests under a 1995 accord with the government. Government peace negotiators, however, said they could no longer verify whether Tiamzon, who uses a rebel alias, was on a secured list of rebels given immunity from arrests. His wife was ineligible because she escaped from jail in 1989 and jumped bail, officials said. A list of 75 rebel consultants supposedly with pictures was jointly deposited by the Philippine government, the rebels and church witnesses in a Dutch vault in 1996 so it could serve as a future basis for identifying guerrilla consultants who could be immune from arrests. Philippine officials and the rebels, however, discovered in 2011 that two diskettes containing the list have been damaged with the passage of time and its details could no longer be retrieved. It made it impossible for the government to verify rebel claims that some of their captured comrades were in the roster of guerrillas with immunity, officials said. The government’s refusal to release those rebels led to the collapse of yearslong peace talks brokered by Norway. A recent wave of rebel attacks against government forces and foreign-owned mining companies and vast plantations in the south has also damaged efforts to revive the talks. The rebels have been fighting since 1969, accusing successive Philippine administrations of subservience to U.S. interests and failing to improve the lives of the poor. Their numbers have dwindled amid battle setbacks, surrenders and factionalism, but the resilient guerrillas remain the country’s most serious security threat.